Ald. 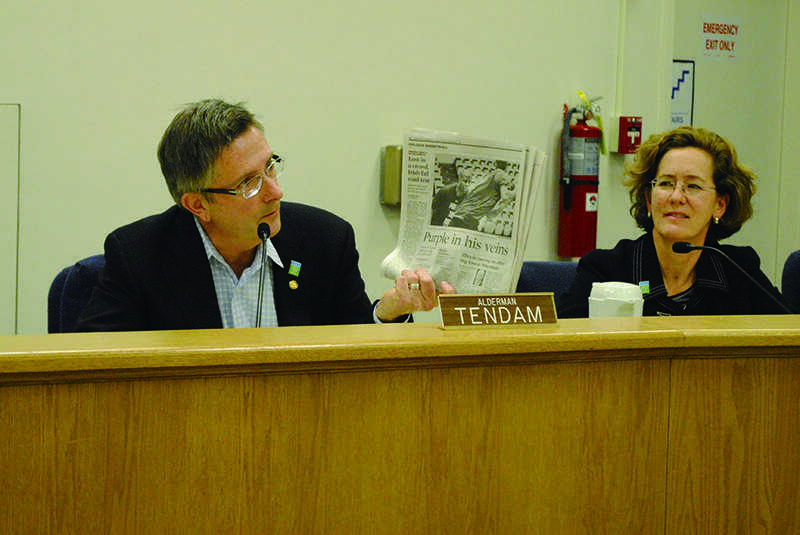 Mark Tendam (6th) speaks at Monday’s City Council meeting Monday night. Aldermen discussed the Davis Street fire and plans to benefit the affected businesses. Evanston staff and a handful of residents revisited the December fire that destroyed three Davis Street businesses and the winter storms that resulted in a snow emergency during Monday’s City Council meeting, its first of 2014. Evanston fire department Chief Greg Klaiber showed residents a video of the fire that gutted Pine Yard Restaurant, 1033 Davis St., TechniColour Nail & Day Spa, 1031 Davis St. and Taco Diablo, 1029 Davis St. Insurance representatives of the business owners or renters are continuing to investigate the source of the fire, he said. “I think it’s so helpful to the community to understand that its really more than the firefighters, it’s everybody working together,” Ald. Judy Fiske (1st) said. A fundraiser will be held at 27 Live, 1012 Church St., to support the workers affected by the fire. When Lulu’s, 804 Davis St., announced it would close this month, some workers planned to continue working at Taco Diablo before the fire, said Gina Speckman, executive director for Chicago’s North Shore Convention and Visitors Bureau. The two restaurants have the same ownership. Public Works Director Suzette Robinson discussed the city’s efforts to manage the two snowstorms that hit Evanston in recent weeks. The city managed to lower snow removal costs compared to the costs of the 2011 blizzard so far this year, even though the recent storms blanketed Evanston in six and a half more inches of snow. In addition, city staff was able to keep streets plowed, although workers had trouble clearing snow piled higher than a foot, Robinson said. “We had, I think, every base covered,” she said. The bouts of rain following the city’s cold periods exacerbated street problems by creating potholes. Evanston purchased more than 26 tons of pothole patches, and emergency repairs were made on Saturday and Sunday. Cracks found in some of the city’s sycamore trees may have resulted from the cold weather. Of Evanston’s 303 sycamores, city officials discovered 60 with the most severe form of cracks, some reaching to the center of the tree, said Paul D’Agostino, assistant director of public works and forestry. City officials will remove the trees, he said. During citizen comment, Evanston resident Kevin Schneider spoke about his experiences working at Jewel-Osco in Wilmette after he lost his job when the Dominick’s at 2748 Green Bay Rd. closed. In the process of applying for the job at Jewel-Osco, Schneider said he received interviewing help from Northwestern’s athletic department. “I feel good to be working at Jewel’s with my customers and new coworkers and former coworkers,” Schneider said. Ald. Coleen Burrus (9th) announced Chicago-based Little Beans Cafe is considering opening a location in the former Jewel-Osco site on Oakton Street and Asbury Avenue.